Pourover coffee at Cafe Dulce. Until recently, coffee barely registered a note in the many love songs to the foods and drinks that have made Los Angeles proud. Sure, great shops like Groundwork Coffee and Jones Coffee Roasters certainly existed here and there, but it was only in the mid-2000s that the city really saw a slow but steady rollout of shops obsessed with making perfect brews and pulling exacting espresso shots. But those, too, were sprinkled about the city; having a coffee shop like Intelligentsia Coffee and Tea, Espresso Profeta or Spring for Coffee nearby was a neighborhood perk, like a Trader Joe's within walking distance or dogs that don't bark after 10 p.m.
Over the last year, though, this city has experienced a caffeine jolt. One after another, homegrown and transplanted Angelenos who love coffee as much as they love their city have set up shop. These newest cafes have philosophies as distinct as the coffee they brew: The hipster vibe of Intelligentsia, it seems, is only a model to be respected rather than emulated. Riding this wave of new coffee shops are patrons -- us -- who, once indifferent to the bitterness in their coffees, now actively care to learn how great coffee can taste and are willing to try a cup or two and learn a thing or three, all for the simple pleasure of a properly made cappuccino. We chose five of our favorite shops that are but barely one year young yet already have us singing their praises. 5. Cafe Dulce. Located in the Japanese Village Plaza, Cafe Dulce provides the Little Tokyo community with a much-needed non-Starbucks caffeine fix. The baristas here know their craft well and, perhaps more importantly, are almost disarmingly friendly as they work their La Marzocco espresso machine. The shop uses LAMILL Coffee for all its drinks; we're huge fans of its Vietnamese iced coffee, but the basics are superb as well. The seating is primarily outdoors in the plaza patio, where, if you're lucky, you'll see people, young and old, in full cosplay costumes jostling for a seat at Shabu Shabu House. 134 Japanese Village Plaza, Los Angeles, (213) 346-9910. Coffee and a pretzel at Coffee Tomo. 4. Coffee Tomo. The next major trend in coffee in this city might be more shops serving beans they roast in-house; if so, Coffee Tomo already is ahead of the pack. The shop emphasizes all things hot and fresh, so each cup is individually made to order by any one of the very highly trained baristas. The food is similarly hot and fresh: rather than boring, stale pastries, Coffee Tomo offers pretzels, baked from scratch and uniquely stuffed with red bean or pumpkin. The owners want to encourage you to get together with friends - after all, "tomo" means "friends" in Japanese - but if you come to take advantage of the free parking, generous table room, and fine coffee, no one will blame you. 11309 Mississippi Ave., Los Angeles, (310) 444-9390. 3. CoffeeBar. Downtown residents and resident workers are lucky to have not one, but two, excellent coffee shops within spitting distance of one another: the pint-sized Spring for Coffee, which opened in 2009, and the comparatively gallon-sized CoffeeBar, which opened earlier this year. Where Spring for Coffee's small space encourages you to go, CoffeeBar's generous, gorgeous space asks that you please stay. You can plug in almost anywhere in the shop; even the seats at the bar have their own individual outlets. 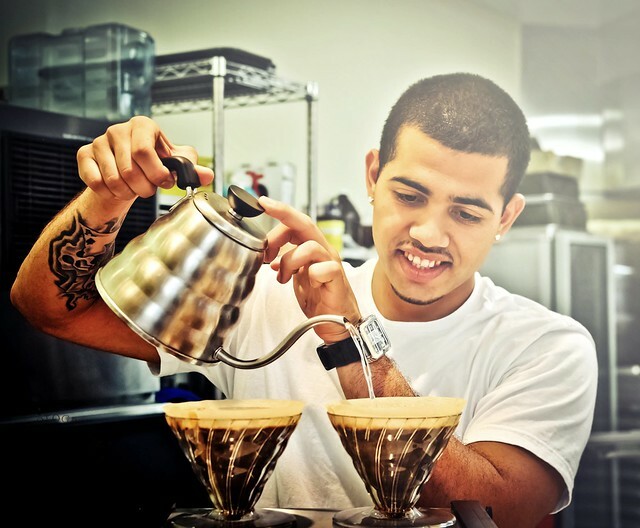 CoffeeBar routinely offers coffee from Santa Cruz's Verve Coffee Roasters and our hometown's Handsome Coffee Roasters. Every once in a while, you can even catch the Handsome boys popping up behind the CoffeeBar counter for a shift or two. 600 S. Spring St., Los Angeles, (213) 327-1157. Siphon-filtered coffee at Balconi Coffee. 2. Balconi Coffee. Exceptional coffee is like a 3D Magic Eye print: it might take a while to focus and see everything you are meant to see, but the effort is worth it. Few shops are better at focusing your sights than Balconi Coffee. Two years after its original location nearby closed, Balconi reopened this year. Using beans from local roasters like Cafecito Organico, the shop makes incredibly flavorful coffee in its siphon filters. After you order, accept the barista's offer to smell the freshly ground coffee before it's brewed, so you'll be primed for the first sip. If you let yourself get lost in the art of that cup, you'll pick up at least one nuanced flavor - blueberries, maybe - and see a picture of coffee like you've rarely seen before. 11301 W. Olympic Blvd., Los Angeles, 310-906-0267. Cognoscenti Coffee's cortado, with a palmier from Proof Bakery. 1. Cognoscenti Coffee. When the recession forced Yeekai Lim to rethink his work in architecture, he turned his love for coffee into a new career. He streamlined the coffee experience, throwing only the essentials - Four Barrel coffee, espresso machine, cups, grinder - on a makeshift cart and popped up around town. He and his Cognoscenti Coffee finally found a permanent home at Proof Bakery, where, in addition to Four Barrel, he also makes fantastic coffee with beans from Coava Coffee Roasters and Handsome Coffee Roasters. The shop has become a true gem of a neighborhood cafe, proving that even if we spend most of the day isolated on our own ships in this concrete ocean of a city, we will always take the time to drop anchor together. 3156 Glendale Blvd., Atwater Village, (323) 664-8633.